On Saturday night (Feb 5) a very hot week ended with a gratifying cool change. Around 9pm Wingello and Penrose experienced a blackout which - as always - the children found exciting. Thinking about the retained heat in the shop and the freezers with all our ice creams, I drove to the shop with Eric and we opened all the doors to let that lovely cool breeze flowing through the front door to the back of the store. The temperature dropped 2 degrees in about 45 minutes but the important part to this story is what happened while we were waiting for Nature to do her work. 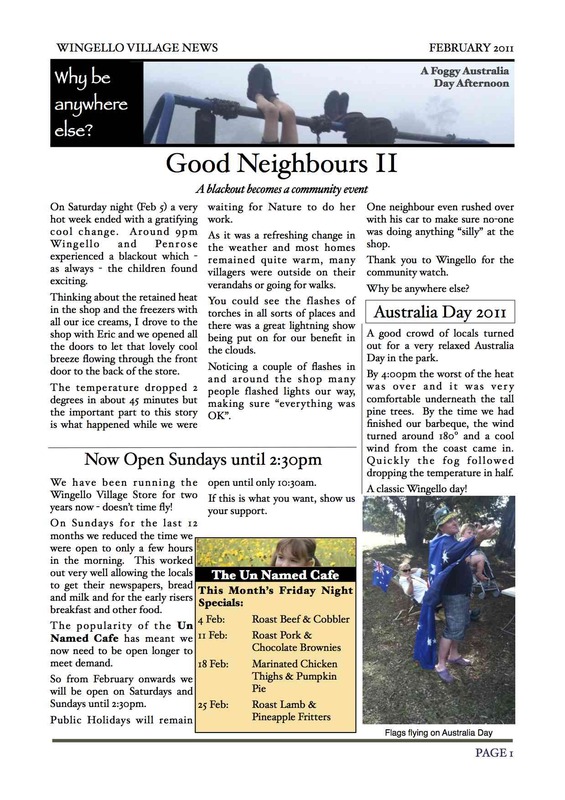 As it was a refreshing change in the weather and most homes remained quite warm, many villagers were outside on their verandahs or going for walks. You could see the flashes of torches in all sorts of places and there was a great lightning show being put on for our benefit in the clouds. Noticing a couple of flashes in and around the shop many people flashed lights our way, making sure “everything was OK”. One neighbour even rushed over with his car to make sure no-one was doing anything “silly” at the shop. Thank you to Wingello for the community watch. We have been running the Wingello Village Store for two years now - doesn’t time fly! On Sundays for the last 12 months we reduced the time we were open to only a few hours in the morning. This worked out very well allowing the locals to get their newspapers, bread and milk and for the early risers breakfast and other food. The popularity of the Un Named Cafe has meant we now need to be open longer to meet demand. So from February onwards we will be open on Saturdays and Sundays until 2:30pm. Public Holidays will remain open until only 10:30am. If this is what you want, show us your support. 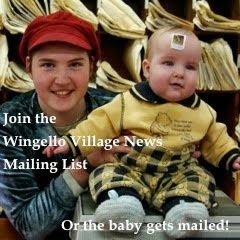 Wingello Village News for February 2011 is out.